The conclusion today of the baptismal celebrations calls the neophytes together again in the Lateran Basilica beside the font in which on Easter Eve they were born to newness of life. Today’s stational liturgy seems to be influenced more than ever by the thought of purity and innocence, like a loving mother carried away by the beauty of her newborn child. On this day in the early Roman Liturgy the Pope used to distribute to the people the Agnus Dei of the blessed wax mixed with sacred chrism, on which was impressed the image of the Lamb of God. This custom, one of great antiquity, took place during the Mass, whilst the schola of the cantors chanted the invocation Agnus Dei before the Kiss of Peace preceding the Communion. The Epistle explains the teaching of St. Peter to the first Christian converts about the sublime dignity to which they have been raised by Baptism. The Gospel befits the return of the newly baptized to the Lateran Basilica; Peter is the pastor whose words have taught the neophytes; John is the co-titular patron of the Lateran baptistry, so that it is in his house, as it were, that the station is celebrated today. After eight days Jesus showed Himself to His Apostles saying: “Peace be to you.” When time is drawing to an end and the last day is at hand, He will appear once more to His Church, and by the gift of His peace will strengthen her against the final persecutions of Antichrist. Alleluia, alleluia. V. (Ps. 117: 24) This is the day which the Lord hath made, let us be glad and rejoice therein, alleluia. V. (Ps. 112: 1) Praise the Lord ye children, praise the name of the Lord. At that time, on the first day of the week, Mary Magdalen cometh early, when it was yet dark, unto the sepulchre, and she saw the stone taken away from the sepulchre. She ran therefore, and cometh to Simon Peter, and to the other disciple whom Jesus loved, and saith to them: They have taken away the Lord out of the sepulchre, and we know not where they have laid Him. Peter therefore went out, and that other disciple, and they came to the sepulchre; and they both ran together, and that other disciple did outrun Peter, and came first to the sepulchre. 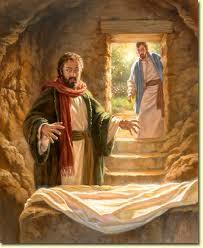 And when he stooped down, he saw the linen cloths lying, but yet he went not in. Then cometh Simon Peter, following him, and went into the sepulchre, and saw the linen cloths lying, and the napkin that had been about His head, not lying with the linen cloths, but apart, wrapt up into one place. Then that other disciple also went in, who came first to the sepulchre: and he saw, and believed: for as yet they knew not the Scripture, that He must rise again from the dead. Blessed is He that cometh in the name of the Lord: we have blessed you out of the house of the Lord: the Lord is God, and He hath shone upon us, alleluia, alleluia. All you who have been baptized in Christ, have put on Christ, alleluia.